Winter is coming! The days are getting shorter, and you feel like sleeping longer. However, at the Green Living Lab, we’re not going to sleep! Come and warm yourself by our rocket stove, and enjoy the events we have planned in our Winter Wonderland. Event times and content are subject to change, so please check the event info here on our Facebook page. 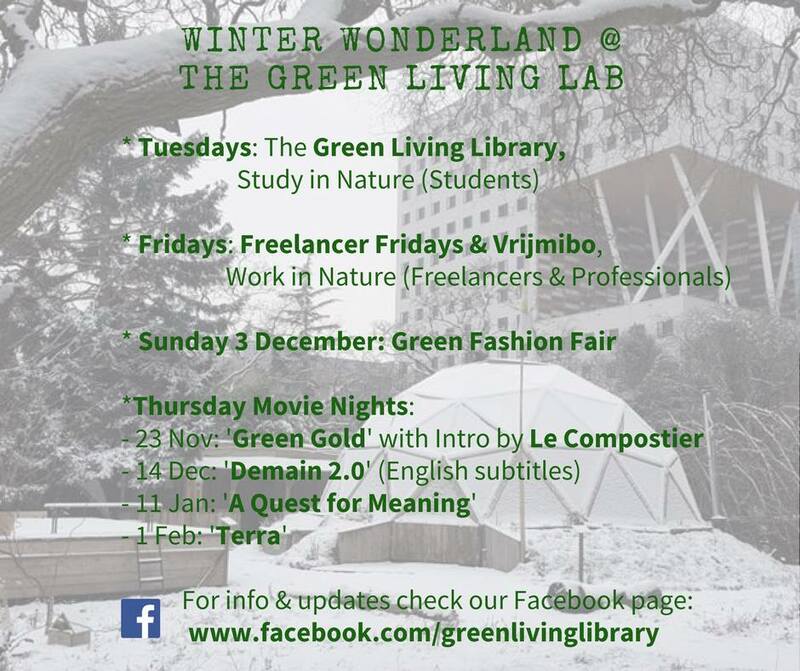 http://greenlivinglab.org/wp-content/uploads/2017/11/Winter-Programme.jpg 579 796 GLL http://greenlivinglab.org/wp-content/uploads/2016/02/logo_340-01-01.png GLL2017-11-19 20:39:432017-11-19 20:42:11Winter is Coming! Check out our new Winter Programme! 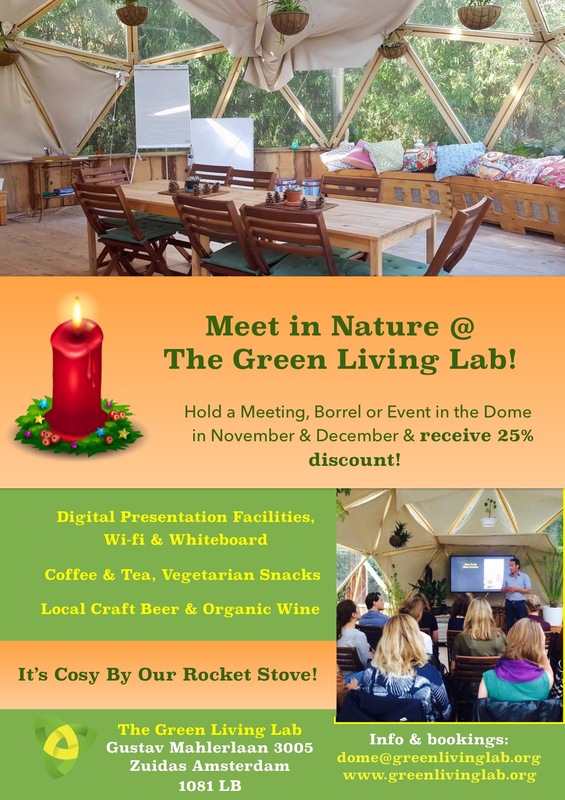 Meet in nature & make merry at The Green Living Lab! 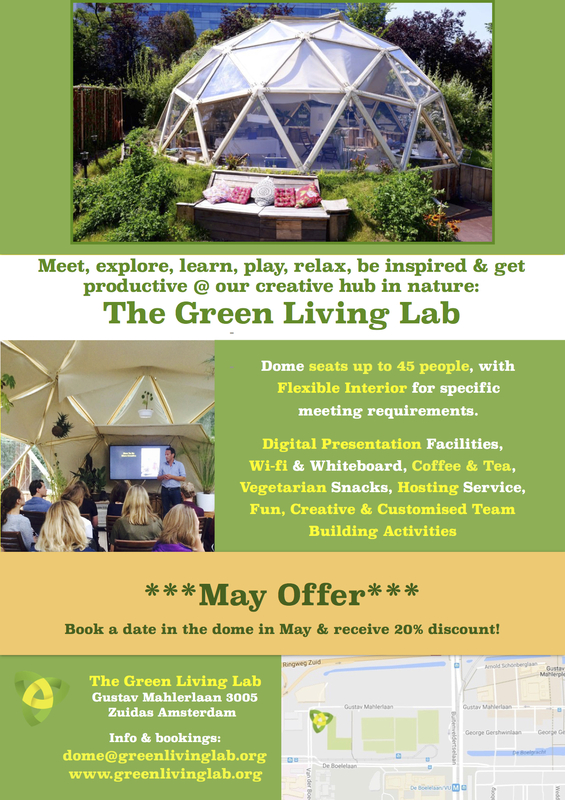 Plan your office meetings, events and borrels in the dome and enjoy our stunning location in Zuidas Amsterdam. All bookings in November or December receive a 25% discount. http://greenlivinglab.org/wp-content/uploads/2017/11/23514635_1717638214922410_11787393_o.jpg 1152 2048 GLL http://greenlivinglab.org/wp-content/uploads/2016/02/logo_340-01-01.png GLL2017-11-19 20:24:112017-11-19 20:42:41Meet in Nature & Get 25% Discount in November & December! http://greenlivinglab.org/wp-content/uploads/2017/03/Green-Living-Lab-March-1.jpg 627 1236 GLL http://greenlivinglab.org/wp-content/uploads/2016/02/logo_340-01-01.png GLL2017-03-24 13:20:202017-03-25 13:37:57Werk, Speel & Ontspannen in de Natuur!